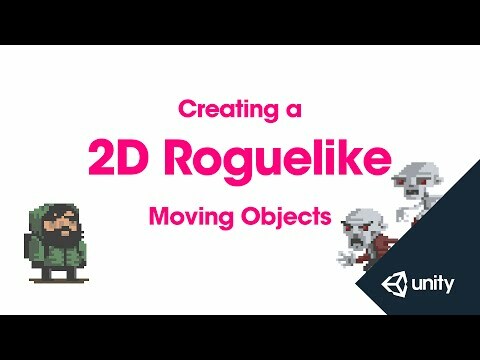 This is part 6 of 14 of the 2D Roguelike tutorial in which we write the MovingObject script which the Player and Enemy scripts will inherit from to share movement code. both our player and our enemies. We're going to create a new C# script called MovingObject. And open it in MonoDevelop. is we're going to make it a public Abstract class. Next we're going to declare our public variables. that it will take our object to move in seconds. variable of the type LayerMask called blockingLayer. space is open to be moved in to. when we were creating our prefabs. Next we're going to declare some private variables. to the rigidbody 2D component of the unit we're moving. to make our movement calculations more efficient. to make it a protected virtual void start. can be overridden by their inheriting classes. to have a different implementation of Start. and store that in boxCollider. to 1 divided by moveTime. which is more efficient computationally. Next let's declare our smooth movement coroutine. to specify where to move to. because it's computationally cheaper than magnitude. closer to the end, based on the moveTime. We're going to do this using Vector3.MoveTowards. that we're trying to move to. times Time.deltaTime units closer to our end destination. to move to the new position that we found. the remaining distance after we've moved. before reevaluation the condition of the loop. We can delete our Update function. as well as a parameter of the type T called Component. by functions in the inheriting classes. it has no opening or closing brackets. and also a racastHit2D called hit. discarding the Z axis data. parsed in when calling Move. that we're not going to hit our own collider. checking collision on blocking layer. And then we're going to reenable our box collider. if hit.transform is equal to null. parsing in the parameter end. to say that we were able to move. to say that Move was unsuccessful. and takes a generic parameter T.
parameters for X direction and Y direction. so that the player can attack and destroy the walls. is going to be a component. and set CanMove to the return value of Move. if move was successful and false if it failed. we're going to return and not execute the following code. attached to the object that was hit. and has hit something that it can interact with. and parse it hitComponent as a parameter. they're going to be interacting with. which we're going to write in the upcoming videos. wall objects in the next video. //The abstract keyword enables you to create classes and class members that are incomplete and must be implemented in a derived class. public float moveTime = 0.1f;           //Time it will take object to move, in seconds. public LayerMask blockingLayer;         //Layer on which collision will be checked. private BoxCollider2D boxCollider;      //The BoxCollider2D component attached to this object. private Rigidbody2D rb2D;               //The Rigidbody2D component attached to this object. private float inverseMoveTime;          //Used to make movement more efficient. //Protected, virtual functions can be overridden by inheriting classes. //By storing the reciprocal of the move time we can use it by multiplying instead of dividing, this is more efficient. //Move returns true if it is able to move and false if not. //Move takes parameters for x direction, y direction and a RaycastHit2D to check collision. //Store start position to move from, based on objects current transform position. // Calculate end position based on the direction parameters passed in when calling Move. //Disable the boxCollider so that linecast doesn't hit this object's own collider. //Cast a line from start point to end point checking collision on blockingLayer. //If something was hit, return false, Move was unsuccesful. //Co-routine for moving units from one space to next, takes a parameter end to specify where to move to. //Calculate the remaining distance to move based on the square magnitude of the difference between current position and end parameter. //Square magnitude is used instead of magnitude because it's computationally cheaper. //Call MovePosition on attached Rigidbody2D and move it to the calculated position. //Recalculate the remaining distance after moving. //The virtual keyword means AttemptMove can be overridden by inheriting classes using the override keyword. //AttemptMove takes a generic parameter T to specify the type of component we expect our unit to interact with if blocked (Player for Enemies, Wall for Player). //Hit will store whatever our linecast hits when Move is called. //Set canMove to true if Move was successful, false if failed. //If nothing was hit, return and don't execute further code. //If canMove is false and hitComponent is not equal to null, meaning MovingObject is blocked and has hit something it can interact with. //Call the OnCantMove function and pass it hitComponent as a parameter. //The abstract modifier indicates that the thing being modified has a missing or incomplete implementation. //OnCantMove will be overriden by functions in the inheriting classes.